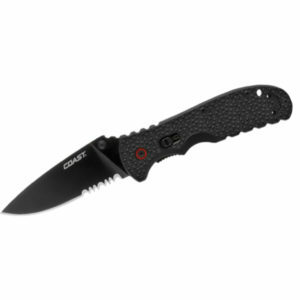 Coast RX300 Blade Assist Knife. The Coast RX300 knife features blade assist technology which was designed by world class custom knife maker and inventor, Ron Lake. 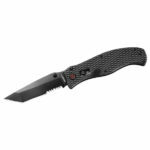 It uses a patented system using a roller-bearing mounted to the blade and a leaf spring mounted between the handle liners resulting in a blade that releases faster, smoother, and safer than other assisted opening knives on the market. A stainless steel frame and nylon filled nylon handle add incredible strength and durability. 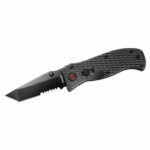 Thumb studs on both sides of the blade and thumb ramping on both sides of the handle make firing the blade easy from right or left side carry positions. The knife uses Coast’s patented Max-Lock technology which provides a second lock system. This safeguard secures the blade closed when not in use and double locks the Liner-Lock when open, even if the Liner Lock is inadvertently dis-engaged. Backed by Coast’s lifetime warranty against defects in materials and workmanship.